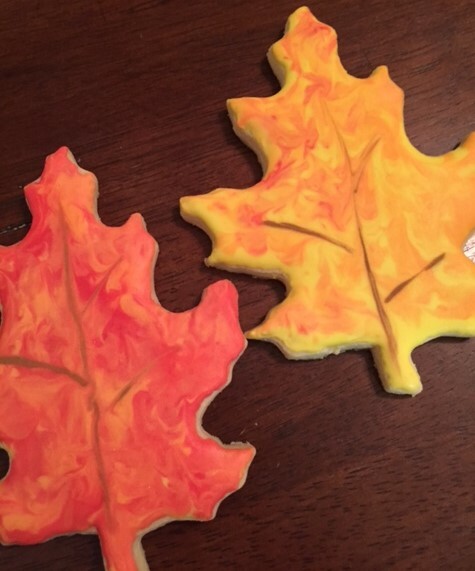 I just painted the last of the Thanksgiving cookies…..turkeys and fall leaves. 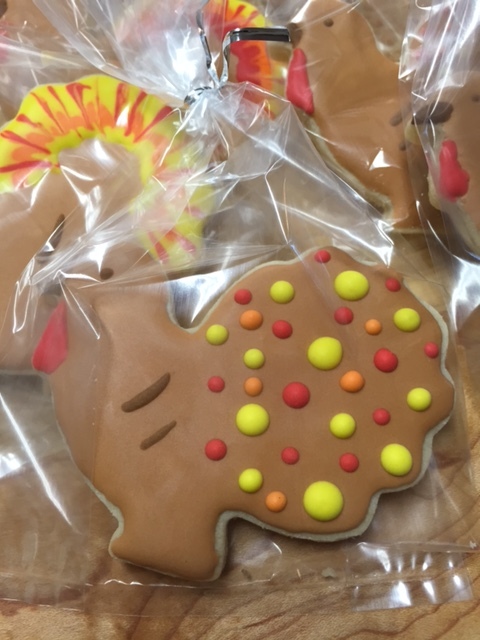 Tonight, I passed out some turkey cookies to a bunch of my neighbors. They are a bunch of elderly ladies that are a kick. They are often gathered outside when I get home from work, sharing the latest gossip. So cute. The way they just giggled and lit up when I gave them cookies, just touched my heart. Then I took some to the local coffee shop and you would have thought that I gave them a million bucks. One young gal came out from behind the counter and gave me a big hug! I passed some out at my favorite restaurant too and the servers were so excited. 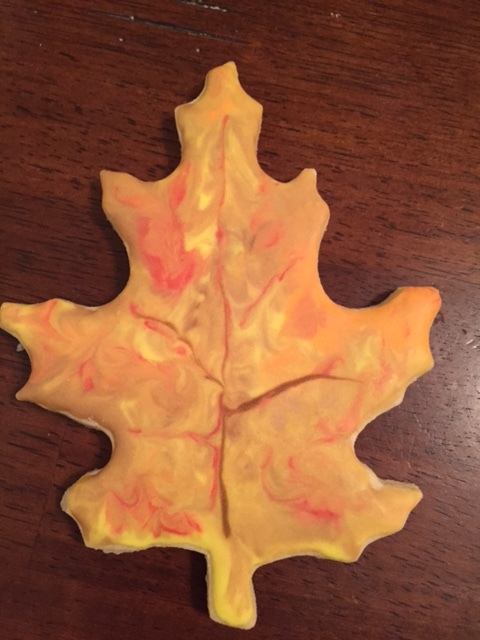 I love painting cookies and passing them out. 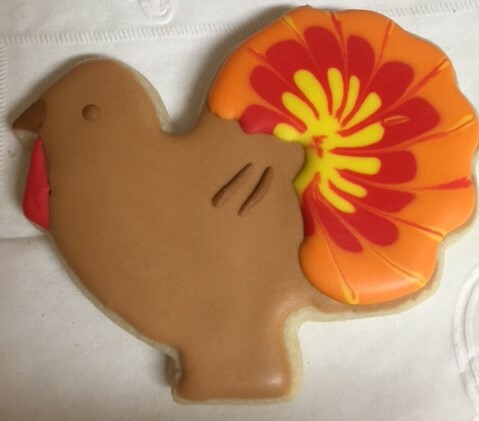 A simple little cookie just brings out the biggest smile. I love that. 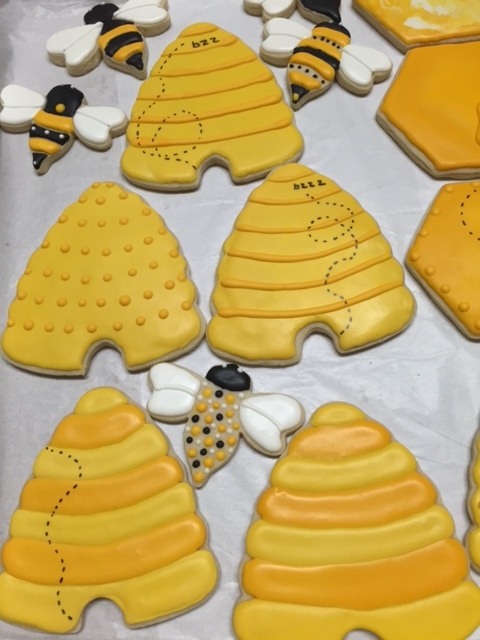 Anyway, just sharing some of the cookies I have been painting this week. So, these that I made tonight, are an easy version. 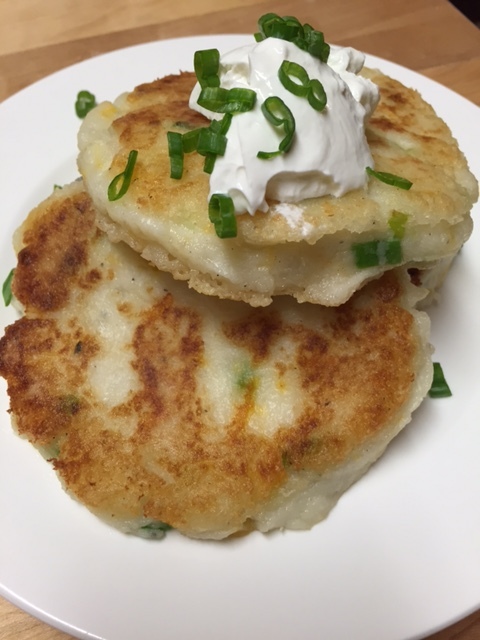 Leftover potatoes, shredded cheese, green onions. That is it. Very simple, very tasty. I give myself an “A”. 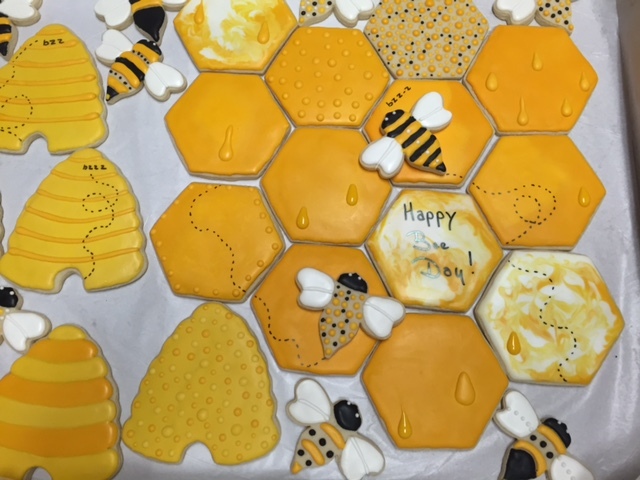 Enjoy….. 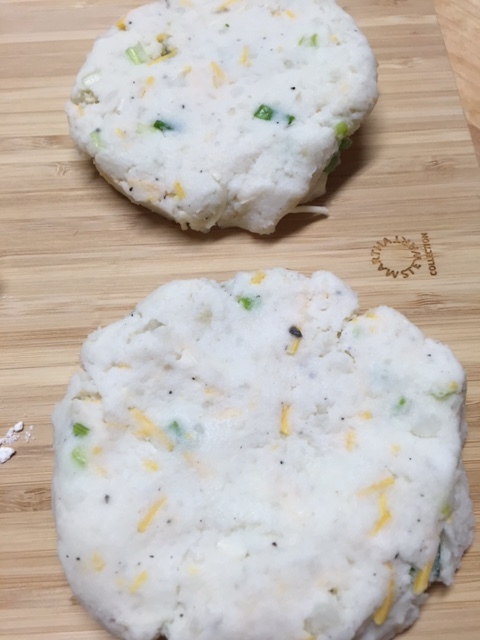 Note: you can use fresh mashed potatoes, but be sure to chill your patties after you form them. Just long enough so that they aren’t too soft. 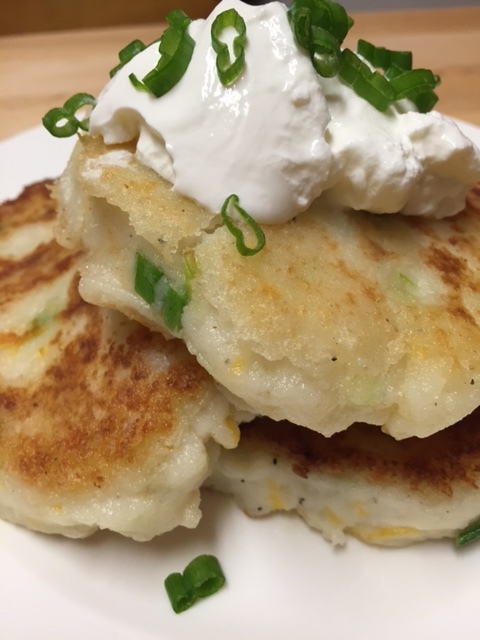 Mix the potatoes, cheese, green onions, salt, pepper and garlic together. Form into patties. Make them as big as you like. 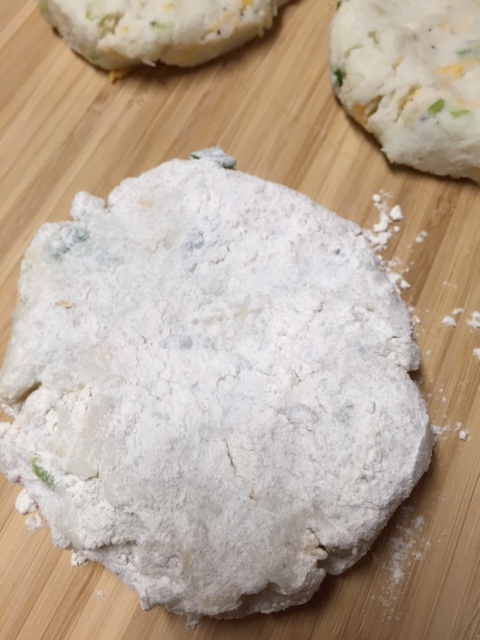 Carefully coat them with flour. In a large skillet, add some vegetable oil. When the oil is hot enough, carefully place the patties in the skillet. Brown on both sides till crispy. (about 2-3 minutes a side). That is it! Simple and delicious. I like mine topped with sour cream or a fried egg. 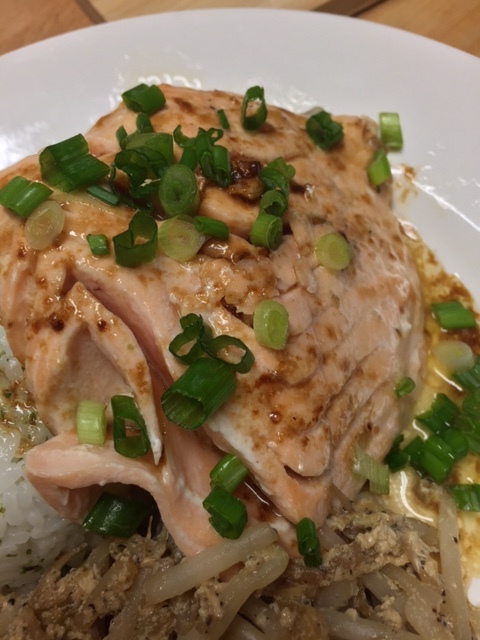 Salmon and Rice with Soy Sauce Butter………………..
All day today I was craving fish. While I do tend to eat way more beef than I should, I really do love fish….cooked or raw (sashimi). I made the best dinner tonight. A nice piece of salmon, pan seared and drizzled with soysauce and butter. Some Japanese seasoned rice and some sautéed bean sprouts. Now, don’t go wrinkling your nose at the bean sprouts. You will love them cooked the way that I cook them. 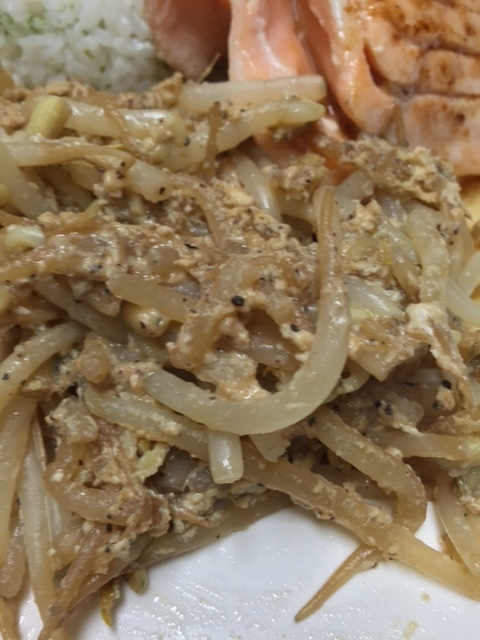 It was a very common side dish with my family, growing up. They are sautéed in just a wee bit of oil, some soy sauce and lots of black pepper. Then you crack an egg into it. The egg gets all scrambled and mixed in with the sprouts. Sound horrible? 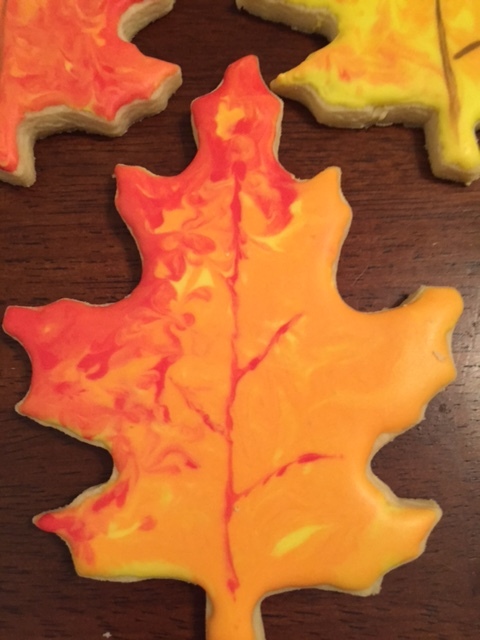 Trust me….they are delicious. Simple, crunchy and yummy. Actually, they are pretty healthy too. I just KNOW you will love them. Let me know if you try them…whether you like them or not! 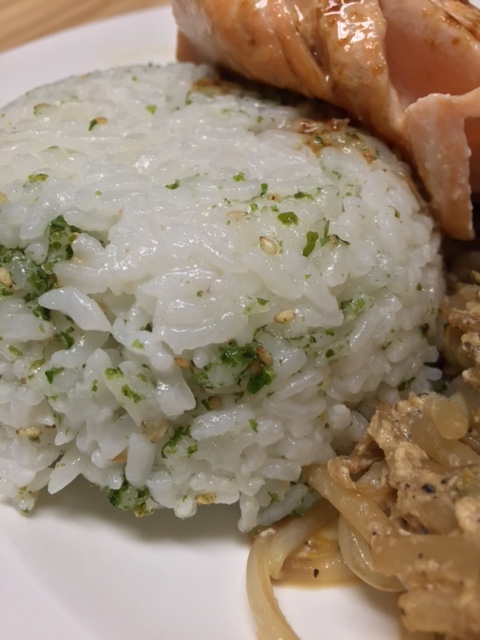 Cooked rice: I just mixed it with some Japanese seasoning called Furikake. There are so many flavors, but this one is basically toasted sesame seeds and crushed, dried Nori (seaweed). I won’t confuse you with a lot of info on this, since there are so many kinds. Plain white rice works just fine and is what I normally use. To mold it, I just packed some into a little bowl and dumped it onto my plate. Fresh salmon filets (make as many as you need) I made one, so these quantities are for one 10 ounce filet. Place your salmon in a skillet, with a tablespoon of oil. Fry for a minute, and then add 1/4 cup water to the skillet. Add 1/2 cup of water if doing 3 or more filets. Cover pan with a lid. Cook like this for 4 minutes or to desired doneness. Once cooked, add butter and soy sauce. Give the pan a little swirl around the filets. Remove the filets and pour the sauce over them. Serve with rice and sprouts, or your choice of veggies. Note: I add the water because I like really moist fish. If you like it drier, leave out the water. In a good size skillet, sprinkle a small amount of oil. Add bean sprouts and toss around just a bit. Add the soy sauce and egg. Stir around till the egg is all cooked. Add the black pepper. Give it a good toss. 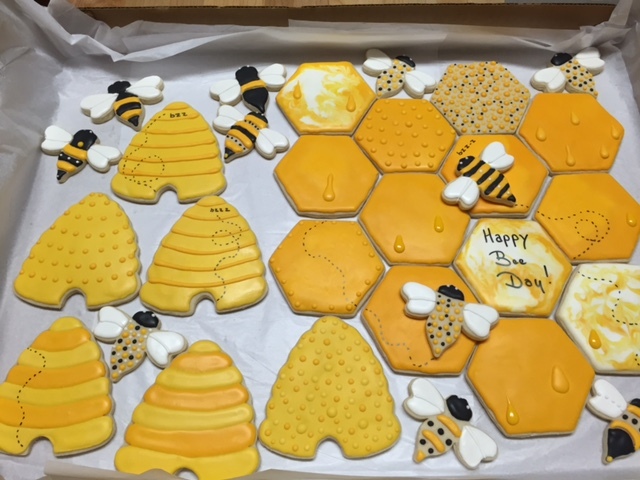 Just wanted to share some cookies I painted. 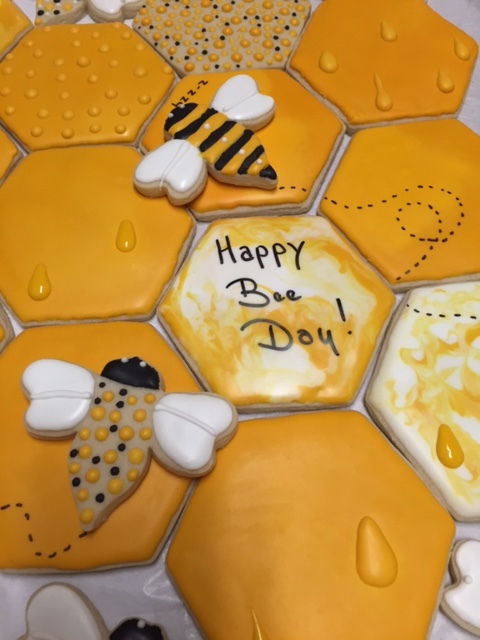 They are for a Beekeepers birthday party. 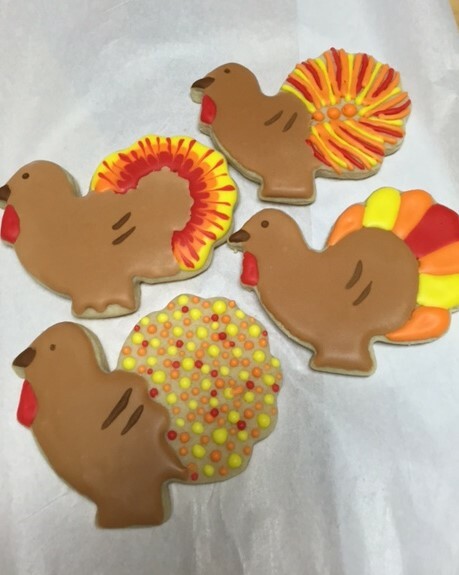 They were so fun to make and I must say that these were some of my favorite cookies I have ever painted. Lorena, I hope your grandpa loves them!!! It’s soup time of year. The other night it was coolish outside and of course when it’s coolish, I want to make soup. The good thing about soup is that you can pretty much throw anything in it. 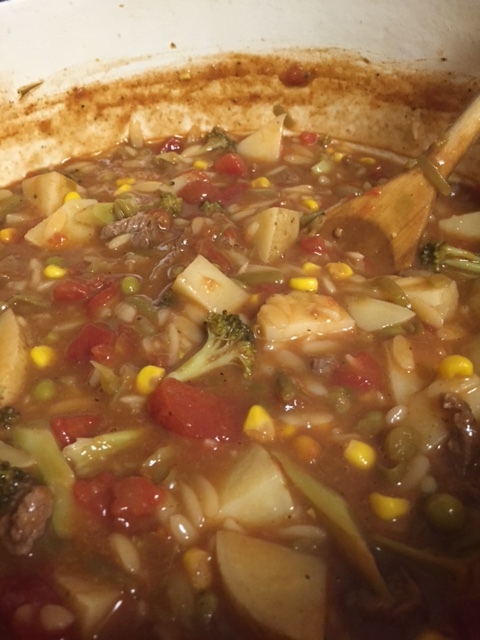 This particular one is a beef veggie soup, loaded with good veggies. I love soup…it makes you feel all cozy. A steaming bowl of hot soup, a chunk of good crusty bread, a good movie…..ahhhhh, nice. I got a little carried away on the spice factor with this soup. I put in a few splashes of hot sauce. Wellllllll, it was spicy. The next day it was even spicier. Still yummy, but a bit spicy. You can use broken up spaghetti, but I used ORZO. It looks like rice, but it’s actually pasta. You can find it in the pasta section of your grocery store. 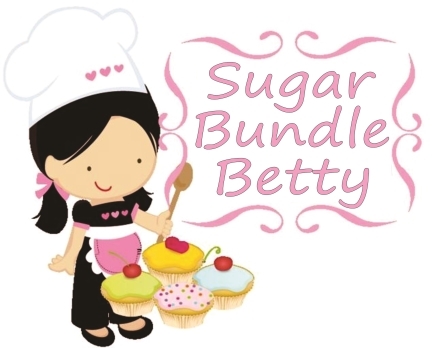 Hope you will make this…. In a big ol soup pot, brown the beef in a wee bit of oil. Add onions and stir till onions are soft. Just dump in everything else except for the orzo. Once everything is dumped in, you can see how much liquid you have. I like my soup thick. Add enough water to get to the consistency you like. After it cooks about half an hour, add uncooked pasta. Cook for another half hour or so. Keep in mind that the pasta will release some starch, thus making your soup thicker. Just add liquid accordingly.